Just when we thought we had a handle on all the uses for digital signage, we found ourselves with an opportunity to explore yet another one. Many of Pridham Electronics’ clients are using digital signage to expand their customer’s knowledge of the products, menu items, savings and investment options and insurance coverages they offer. We are well versed in helping our clients select the best platform providing the best content thru the best hardware at the best price point so helping this client explore options for a somewhat different application was right in our wheelhouse! This application was intended to help Stoughton Trailers, a major Midwestern manufacturer communicate more effectively with their employees in three specific areas of their facility. Think of a digital internal HR bulletin board that can change by the day or even by the hour. First, let’s explore Stoughton Trailer’s content requirements: general company information, safety updates, meeting notices, shift updates, new employee introductions, holiday notices, employee of the month names, birthdays, retirements, etc. This list covered everything they were trying to communicate to their employees thru multiple printed notices posted all over this massive facility. Next, let’s take a look at their platform requirements: simple to create an outline or layout to be used repeatedly, easy to change and update items in the outline, and able to push the content to all screens simultaneously. And finally, let’s take a look at the screens used in this project. Since each audio and video system we sell is a custom design, an onsite visit by one of our designers is the first step in the process. Stoughton Trailers was very specific in asking our designer to place flat screens high traffic areas where employees pass thru each day multiple times. The first screen was placed inside the employee entrance which is right by the time clock. The second site was the breakroom where the flat screen could also be used for meetings and training sessions. 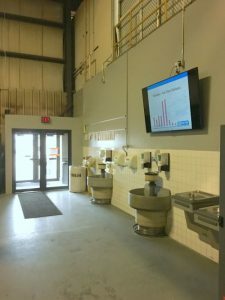 Since the content was specific to Stoughton Trailer’s HR department, that area was the third logical site, enabling employees to see the content as they waited for assistance. The size of the flat screen and the type of mount were dictated by the space available, the best viewing height and angle, paying attention to any challenges presented by the existing lighting. 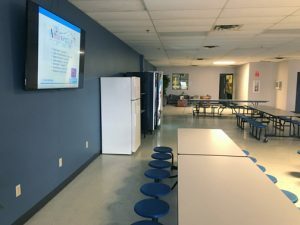 In a matter of a day or two, the customer had in hand a complete custom layout and design, organized with equipment and installation labor for the three specific areas where the digital signage screens were to be installed. In most cases, training is a crucial part of the installation since the customer’s ability to fully utilize the capabilities of the system is directly related to their satisfaction with the system. When a digital signage player is required, we regularly provide training on-site, via teleconference or thru written instructions as well as training updates as the capabilities of the system changes thru hardware or software updates and personnel at each customer location changes or expands. In this case, Stoughton Trailers was creating and distributing their own content so no player or training was required. By using their new digital signage system, Stoughton Trailers will be able to visually communicate with all of their employees, simultaneously updating the content on all their displays quickly and easily. And most importantly Stoughton Trailers will be keeping their employees up to date and fully informed. And so goes the ever-expanding roll digital signage is destined to play in visually communicating with shoppers, diners, patients, students, commuters, customers…and, yes, employees. How do you communicate with your employees? PreviousPrevious post:Finding the Perfect Music for Your BusinessNextNext post:Music is FREE, right? WRONG!